Send money via check or PayPal: The frames require a 50% deposit, whereas the stems require the full amount. Fill out the order form: Please fill out our custom order form, or if you prefer to mail a hard copy, you may also use our mail-in version. The following categories represent common points along the Custom Continuum that have been selected out for the purpose of listing the typical properties of the design and base price. 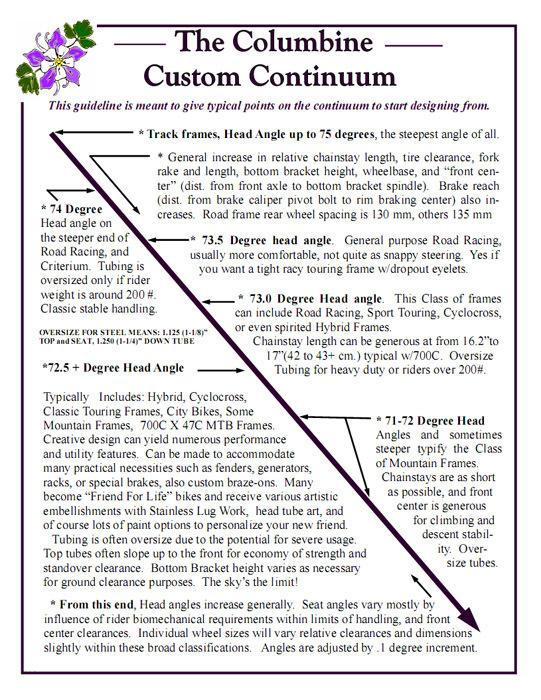 You can order anything along the Custom Continuum even if you do not see that listed here, including mixed geometry and custom brazed on parts. Payment for custom products is non-refundable. Payment is deposited upon reciept, not at time of shipment. Call us before placing on online order for custom products. Universal clamp on quickchainger is an active chain management aid that catches and holds your chain so you never have to touch the chain again! The Quickchainger allows the average rider to change wheels faster than a seasoned pro mechanic! Always built with the worlds finest tubing, 100% Silver brazed, with custom swirl cut investment cast lugs and polished Stainless Steel dropouts, and a gold accented Columbine Flower cut into the top of the downtube lug, as well as the metalwork masterpiece of the integrated fastback seatstay clamp . Unique Columbine fabricated brazed on fittings done in polished brass include: internal rear brake cable ferrules on the top tube, pump peg, adjustable downtube shift cable stops, and chainstay cable stop, also stainless polished bottom bracket cable guides, and Columbines patented polished Stainless Steel Quickchainger chain catcher and manager. Other standard brazed on fittings include two sets of water bottle mounts, and optional downtube shift bosses. Finish details include a choice of over 35 colors of Dupont Imron paint over Dupont Corlar Epoxy primer, and richly detailed gold accented decals with the famous Columbine wildflowers and vines. These frames are really occupying the long space between Road and Mountain, and the starting and ending points are fuzzy. They can be made with the lightest standard diameter Road tubing sometimes, or heavier larger diameter MTB tubing. Generally, they have sloped up top tubes for economy of strength and standover clearance, 700C wheels, and can have several different fork styles to meet your needs. This is a wonderful class of “do everything” bike, and they really do all but the most extreme Mountain descents very well. They can be made for two sets of wheels, such that a Road racing set with 25C tires renders the bike a nimble quick speed bike that can be lighter than many racing bikes, or they can use knobby 47C tires for most off road work up to serious 700C mountain biking if built toward the heavy duty side of the spectrum. Built with lugs and 100% Silver brazed, these frames explore the amazing lower rolling resistance and natural spring suspension qualities of the larger wheels/longer spokes and longer fork, especially using the short butted DT Revolution 14/17 gauge spokes. I call these the “Friend for life Bike”, and for obvious reasons, they make the best touring bikes. Lighter models can be built for long reach side pull brakes for less cost, but standard price is with cantilever/vee brake mounts. Fastback seatstay clamp and many brazed on parts shared with the Road frames where appropriate. Parts, some tubes, and castings are not yet made to deal with the geometry issues in this class of frames, so there is quite a bit more labor in them due to the ticklish part fit up caused by difficult angles created by bent chainstays and seatstays and long forks, hence the difference in price from the Road frames. These were of course invented by Rich here at Columbine! A bold statement for sure, but if you look at the “modern” geometry of the MTB, you will see the geometry that Rich pioneered in the mid 80’s when other major players had 68 degree head angles and 17” plus chainstay lengths. Columbine Mountain frames have the shortest chainstays in the industry, head angles from 71-72 degrees, polished Stainless Steel dropouts, investment cast lugs, fully 100% silver brazed for the ultimate strength, with options on steering column type, or without the fork for suspension fork substitutions of your own choice. Also, in the mid 80’s I began to wonder why MTB’s had to be locked into the 26” wheel, when a bigger wheel made a lot more sense for getting over rocky ground, and with the longer fork and spokes, it had much more natural suspension. I built my first 700C heavy duty Hybrid/MTB frame in ‘89, and found it much more suitable for the kind of off road riding that I do. So ask about the big wheel Mountain frames. More tire possibilities become available regularly as other manufacturers explore this great Mountain wheel. If you are not going to need a 6” suspension travel downhill bike, big wheels might be just what you’re interested in, and when naturally suspended, bikes stay light, simple and non-redundant as they were meant to be. Includes an elegant braze on package (see above), fastback stays, swirl cut head lugs, Quikchainger, cantilever mounts, and 35 colors to choose from. Please ask about the super possibilities with the 650 wheels (metric 26") for fast road bikes. With them, we can achieve an excellent frame geometry and handling matching the 700C models, and with the new superlight spokes, you can recoup the comfortable nature and rolling ease associated with the larger wheels. A bike made with 650 wheels requires more planning and forethought because of the potential for a bad match of wheels and components with the frame, but with a little perseverance, it is a worthwhile project. Prices are the same. Crafted from 300 series Stainless Steel with Gold filled* flower on the handlebar clamp portion, machined Aluminum cone quill expander, with recessed binder bolt. These stems compare for weight with Ti stems, and have more vertical adjustability than others. The Ultra Stem with Stainless Steel tubing, TIG welded, polished, w/recessed binder bolts, and polished gold flower on the H-bar clamp has the same design as above. 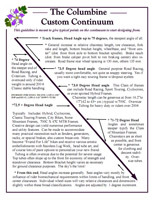 Custom extension angles and lengths to 14 cm., and even art. Features a single hidden binder bolt on the quill end and handlebar end, and custom integrated and/or removable spacing for height depending on steering column length, flower as above. Polished Stainless Ultra Models. * Sizing on stems is completely custom, and any angle or extensionlengths (4.5 cm to 15 cm) is available. If you have unique size/angle ideas, please sketch them up and mail or fax them to us. etched onto the surface for about 50 times more gold than with Gold Plating. Many of the braze-on parts below are custom made here at Columbine from Brass or Stainless/Steel. They are made here because they solve problems not addressed by commonly available parts, and are made without mass production machinery, so are a bit more expensive. Brass is used to reduce friction where cable or threaded adjusters may contact, and when polished, masked and clear coated, has a very popular classic appearance. If you don't see a paticular type of braze-on mounting idea, ask and we'll try to accommodate that and make it for you.